Henry Schien is a distributor of healthcare products and services primarily to office-based healthcare practitioners in the North American and European markets. The company operates through two segments, Healthcare Distribution and Technology. The Healthcare Distribution segment provides all kinds of consumables including pharmaceuticals and diagnostic materials as well as dental equipment, X-ray equipment, etc. to dentist and doctors offices. The Technology segment offers software and related products that primarily include practice-management software systems for dental and medical practitioners and animal health clinics; and financial services and continuing education services for practitioners. The company has over half a million customers and is the largest company serving the market of small dental, medical and animal health practitioners.It has expanded beyond North America and Europe into the People's Republic of China, Saudi Arabia, and the United Arab Emirates. Henry Schein is $5 billion company. Financially, by virtue of being on this screen, it maintains reasonable valuation (PE of 17, PEG of 1.18, Price-to-Sales of 0.8, very little debt) and has been able to show steady earnings growth. Click around on the chart below. Quarterly results are a little erratic but in general, annual earnings have been on a nice up-trend. 2009, though, a year that has been so tough for many companies, looks to be a bit disappointing. In any case, the company will be reporting fourth quarter earnings soon and investors will be looking for continued sequential improvement. In the most recently reported quarter, international sales grew about 8% though domestic sales were slightly negative. The Technology segment turned in 5% growth and, though it is significantly smaller than the Healthcare Distribution segment, the company benefits from gross margins over 70% in the Technology segment. You can see that all three of the trending indicators we screen for are currently bullish. Unfortunately, investors appear to be getting cold feet as we approach the earnings report. In any case, we have a company that is by no means expensive and has the opportunity to benefit from the surge in healthcare stocks. The company is well positioned to benefit from several trends in the industry. Management is projecting increasing consolidation in its niche and, as the largest company in its sector, they believe they will be able to acquire smaller players that will allow Henry Schein to expand its footprint and market share. Trends toward cost containment will favor the company as it is big enough to achieve economies of scale that are unavailable to smaller competitors. As with most healthcare companies, they point to the aging population as a source of increasing revenue. On the other hand it is hard to predict what the unintended consequences of government-driven healthcare reform could be for the company. 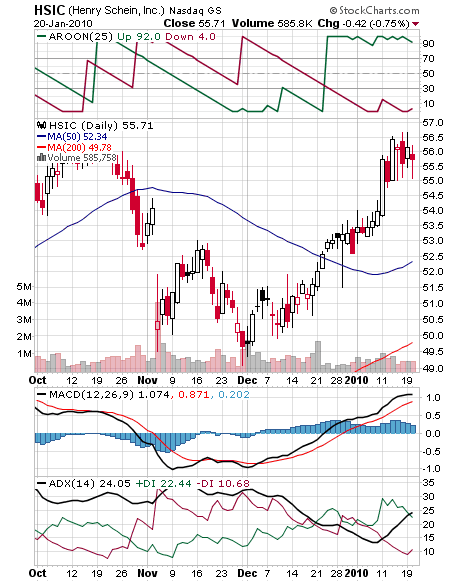 In summary, it appears we have a conservative company at a reasonable valuation with a strong stock chart whose price is faltering slightly prior to an earnings report. This seems the perfect candidate for a watch list. Even if the company beats earnings expectations, it looks like investors will have an opportunity to catch the stock at a lower entry point.